We all have the opportunity to be the change we would like to see in this world. 1Hr x 100Women x $100=$10,000 for a local F'ton Charity. 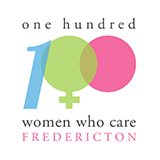 100WomenWhoCare is based on the simple concept of bringing together 100+ local women to make a large impact within their community. Only 1 hour of your time every three months. The meeting is taking place at Kingswood Lodge, located at 31 Kingswood Park, Fredericton (down Hanwell Road). The event will get underway at 5:30pm with the Meeting commencing at 6pm sharp so please ensure you arrive in plenty of time to register. The venue and the bar will be open before and after for networking. The meeting will begin with a brief welcome, followed by three 5-minute presentations from the randomly selected charities. Following their presentations, you will then vote for the charity of your choice. Ballots will be counted and you will write your cheque "on the spot" to the winning Charity. Only 1 hour of your time every three months, watch and see what your $100 can do for your community! !